Sign up for more in your inbox from Thea at That Sweet Tea Life! 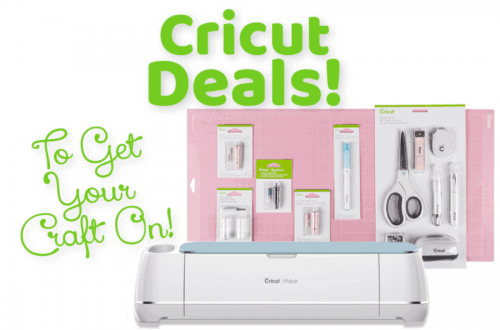 I’ll send you my most recent deal on the products and supplies I love!! In my research I came across Select Surfaces (<~ Click that to check them out!) and decided to reach out to them about collaborating! Great news for me (and you) is that they agreed! 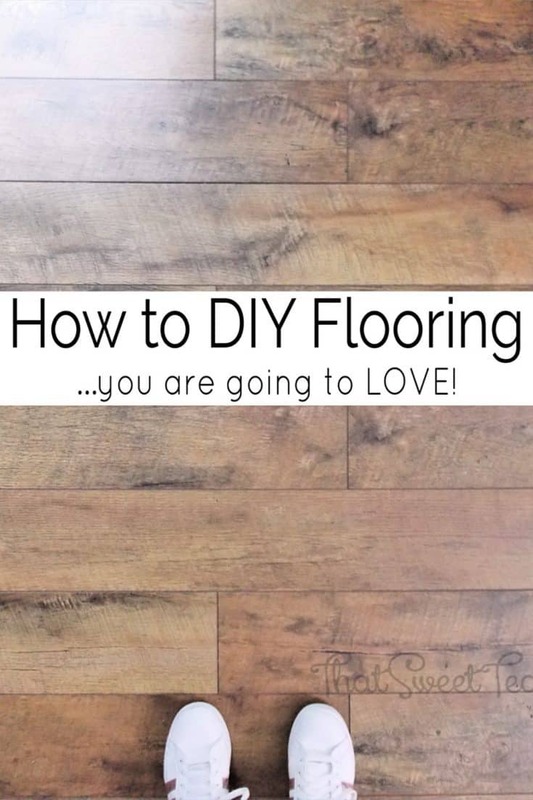 Whats rather ironic, is as I began working on the project I was surprised to find how inexpensive it would be to DIY flooring in my home! Who knew?! Had I known how simple and within budget the project would be, I would have likely wanted to take it on a long time ago! 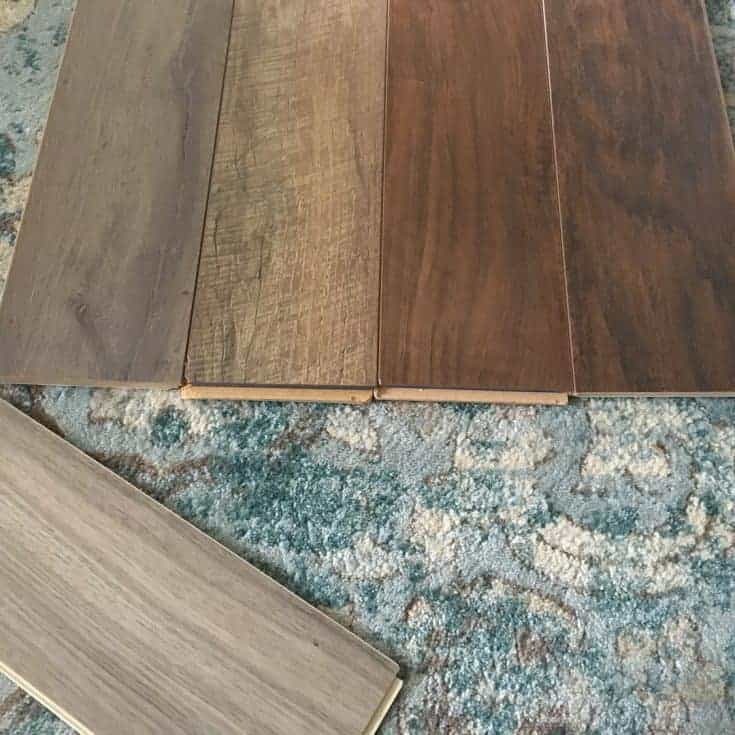 Nevertheless, Select Flooring sent me some samples to compare! You can see them laying across my favorite rug to coordinate the style. 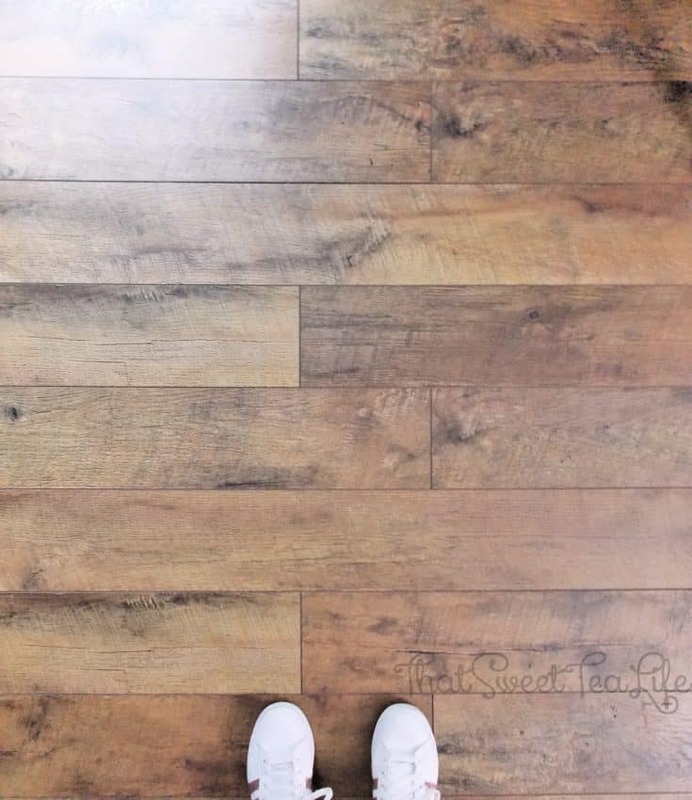 Which wood flooring look do you love? 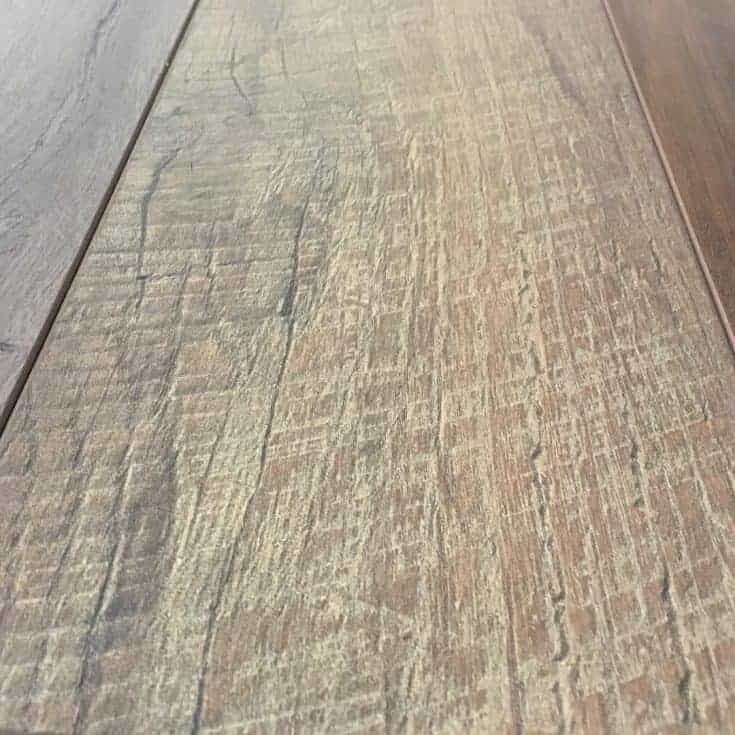 My favorite would end up being “Driftwood” Elite Flooring. I absolutely loved the rustic texture they had incorporated into the design as well as the coloring that was rustic and rich but not too polished. 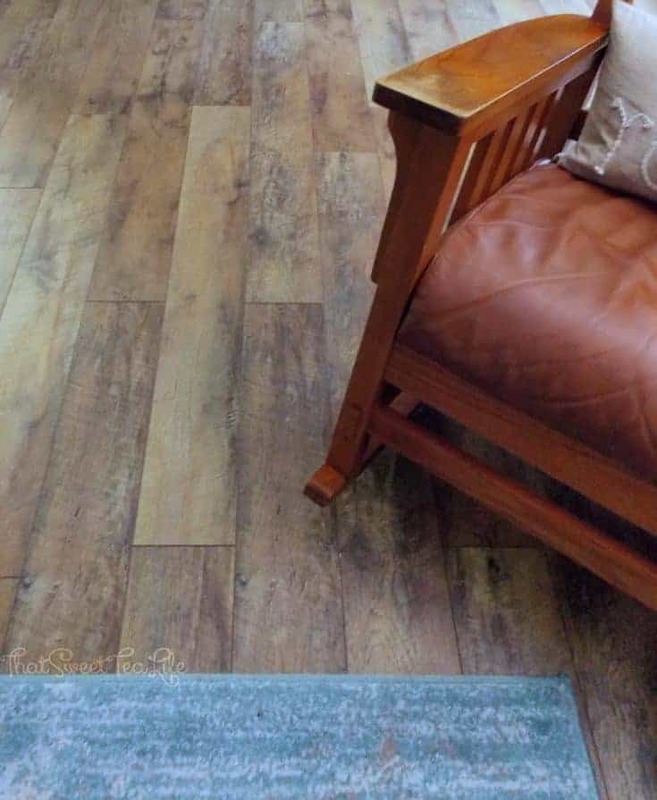 I felt like the DIY Flooring would compliment our style-or the style I was attempting to create- as well as our lifestyle. Once I had my style selected I would be able to go onto my local Sams Club website to pre-order. I knew how much I needed because I used the Select Surfaces Driftwood Calculator to calculate it. They had my order ready in just a day! Then it was time to go pick it up. Here is the awesome part! 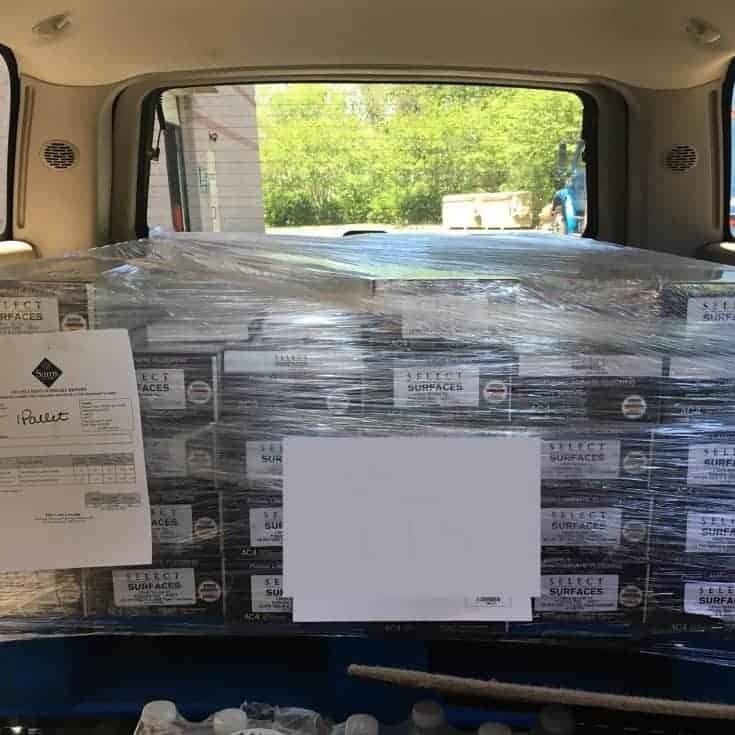 I drove up in my Chevy Tahoe and they were able to use their forklift to place the entire pallet inside the back! It slid in perfectly! If you dont have a truck with ample room-be sure to be ready to help load it and maybe bring help. I was rather clueless and came alone! So, I was thankful for their decision to simply leave it on the pallet and load it up for me. 😃 However, the next step would be getting it home and loading it into the house to acclimate. You want it to just lay in your home to get to to temperature before install day. 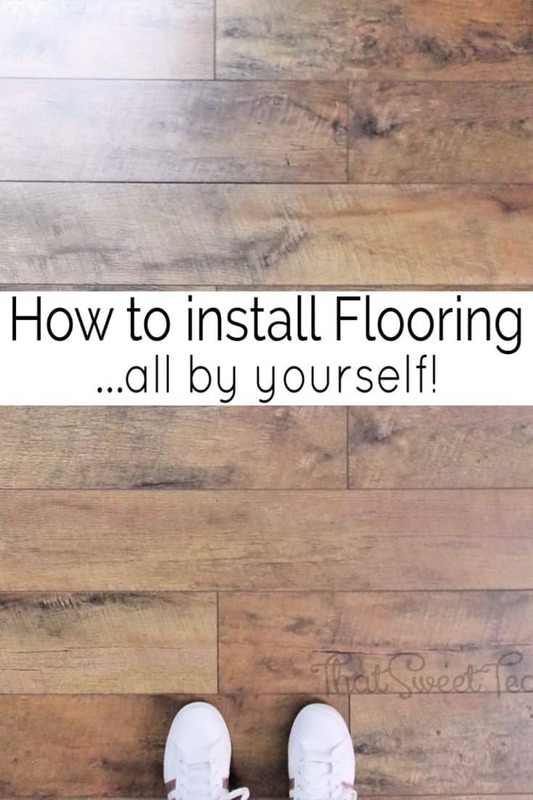 Check the instructions on your flooring to find out how long. First things first. I had to get the room ready for installing the DIY flooring! Now, since I was approaching this project solo, I wanted to be smart about the way I took it on. After vacuuming the carpet really well I decided to remove it in narrow strips I could easily carry. So using my carpet knife I began cutting through the carpet and padding into “strips”. 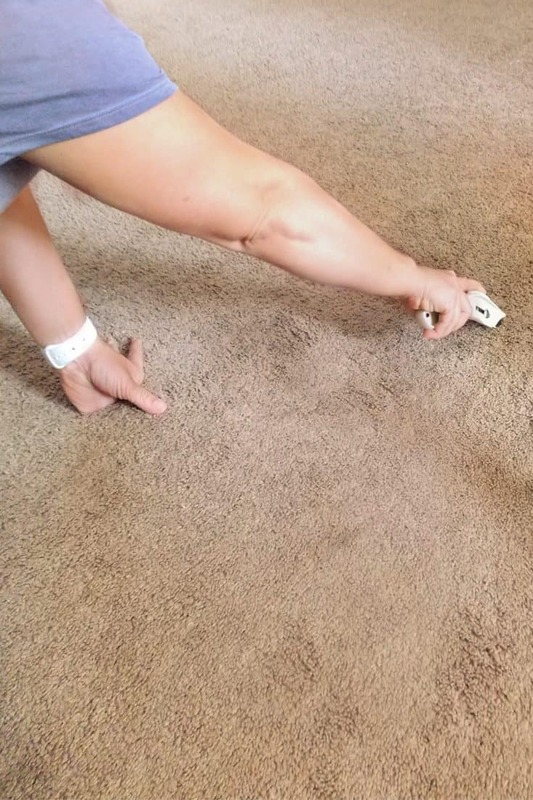 I couldn’t believe the amount of dirt left up under the carpet! Especially considering I had just vacuumed before pulling it up! This is what we have been living with? 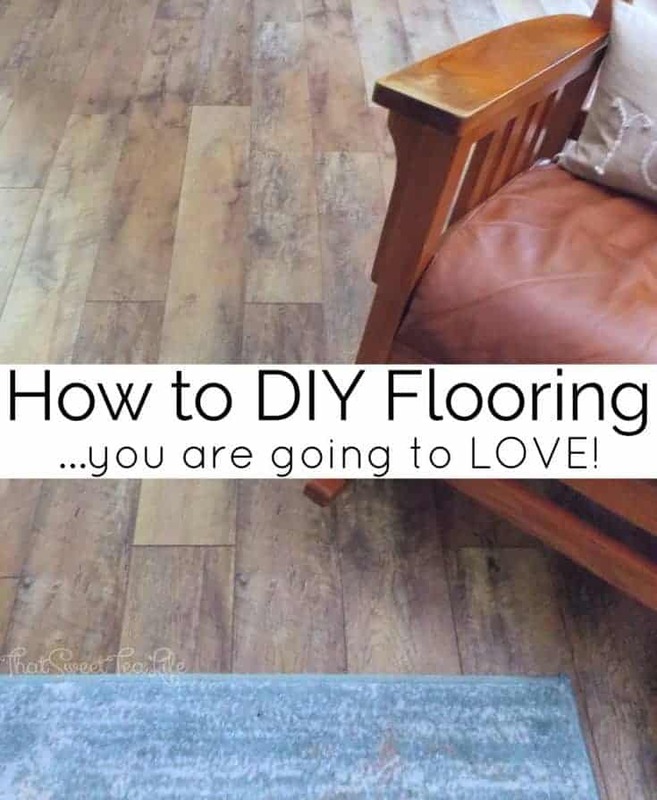 I knew by tackling this easy to diy flooring I would be eliminating so much hidden dust and dander! After the carpet was pulled I began pulling up all the staples and such that were left behind. 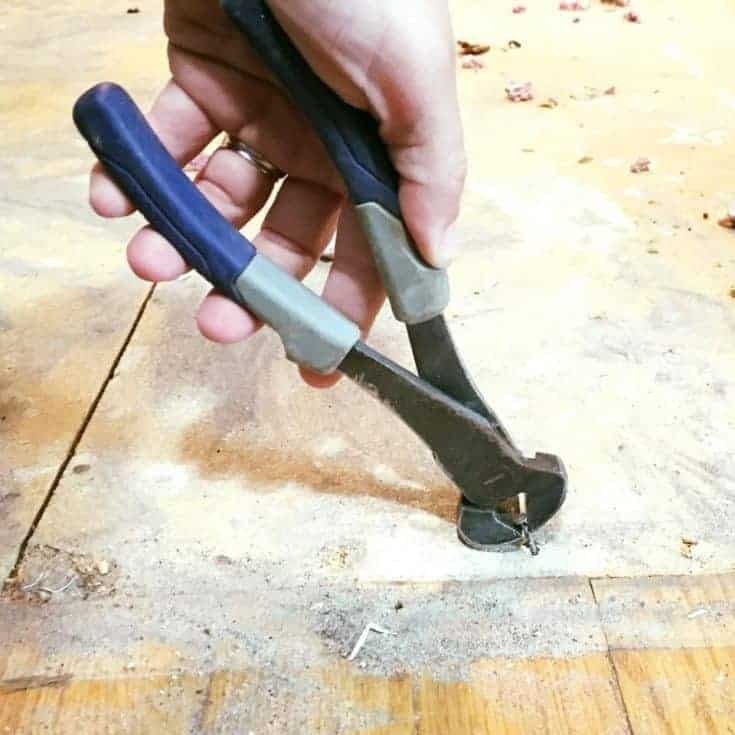 This little tool became my best friend! Its a Pincer Plier also known as a nail puller or end cutting pliers. (👈🏽 that’s a clickable link that will earn me a small commission if you shop through it). It made easy work of pulling all those staples! You will also find tack strips along the walls and entry areas. 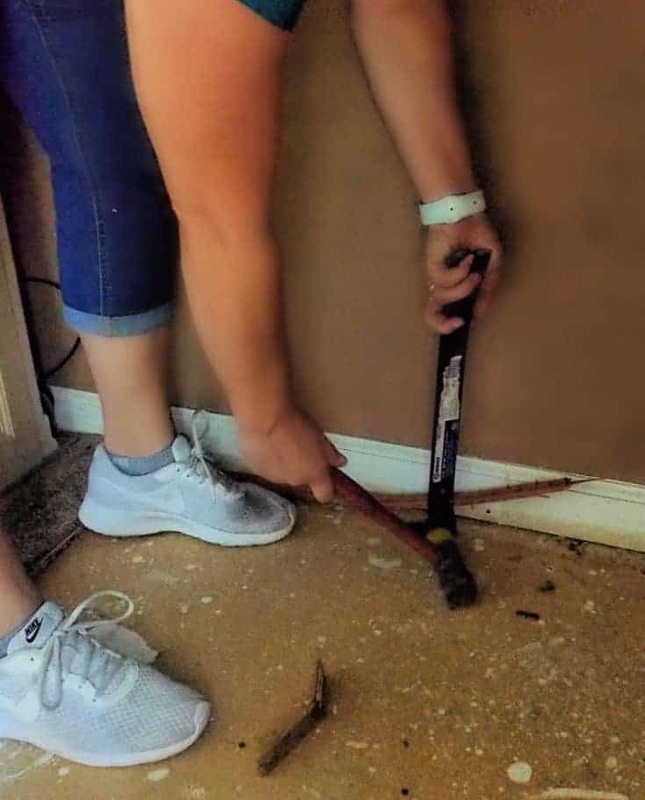 Using a pry bar those strips can be pulled up and again those pincer pliers can be used to pull up any nails, tacks or staples that are left behind. Once everything was pulled and cleaned up it was time to begin laying everything out. 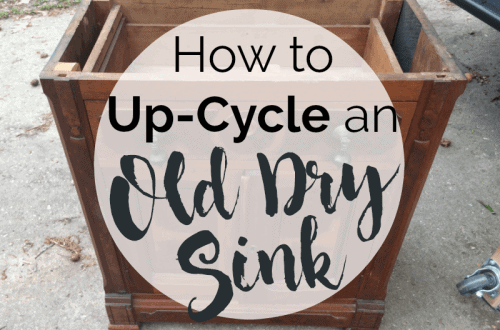 Be sure to read all the instructions and “dry fit” a few rows before actually starting! Sometimes we can think we have it all down but end up misinterpreting the instructions. You won’t find out until it’s too late! Also, most flooring will come in various boxed collections. I found 4 different boxes I was able to pull from to be sure the look of the flooring varied as I continued to lay it down. Here you will see I tackled this in a rather un-orthodox way. I had decided I would chip away at this project day by day during the kids school hours. I wanted to see how long it would take me to do it on my own. As I laid a section I would incredibly carefully pull some of the furniture back over to the section that was completed. I dont recommend this! But, I inspected closely as I worked to ensure there weren’t any gaps or shifts. 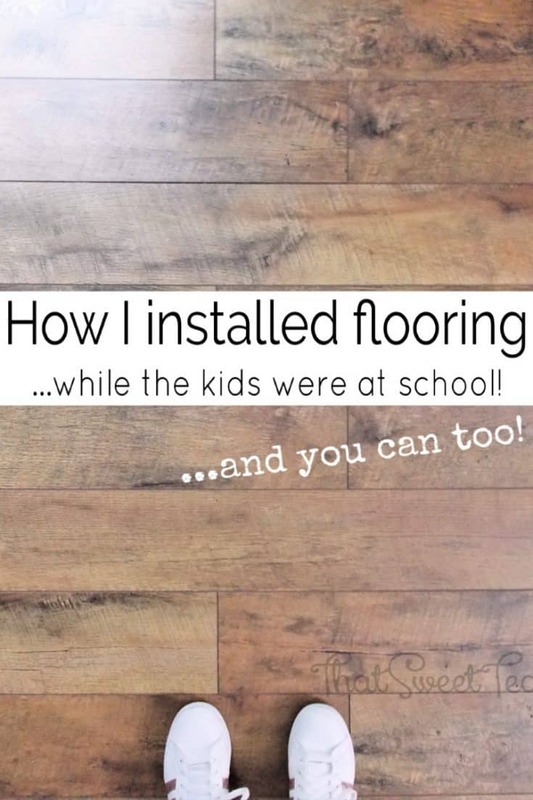 This would allow me to keep most of the furniture in the space and simply shift it as I completed my DIY Flooring. Within three five hour days I was done! I can not even tell you how thrilled I am and ready to take on the rest of the house! The color option we chose is absolutely perfect for our lifestyle. “Driftwood” has a gorgeous variety of warm reds and yellows broken up by deeper espresso browns. The manufactured texture gives a rugged yet not “unfinished” feel that is perfect for the way we live. Pretty and polished but not overly “perfect”. I could not be happier with how easy the project was and the result! Isn’t it pretty?? Look at all the color variety! Because of the color variation, another positive is that it doesn’t look dirty easily. 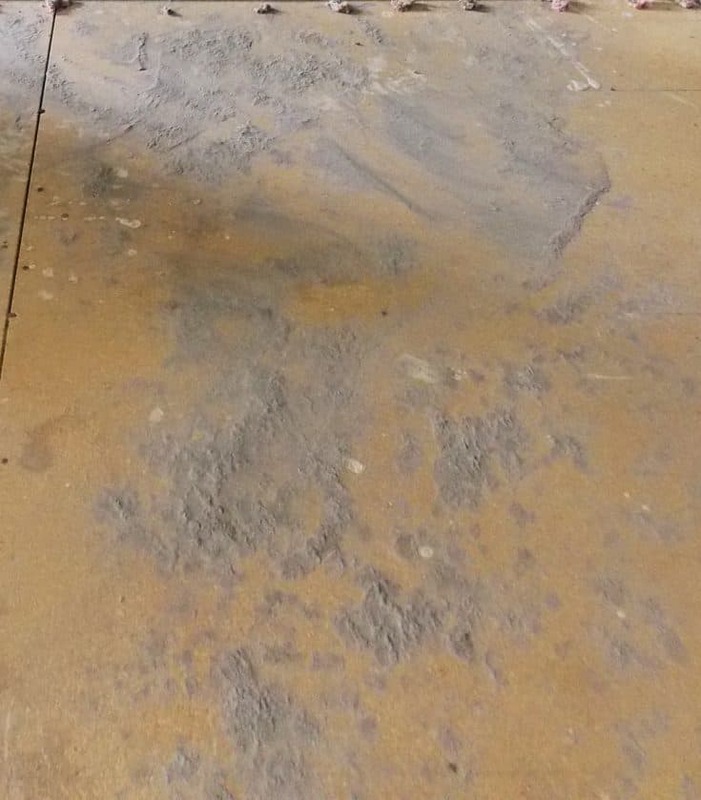 It actually camouflages dust and such so I dont find myself going crazy sweeping constantly to make it look nice. See? You wouldn’t even know my daughter spilled an entire box of cookies there would you? No, I’m kidding but isn’t it pretty? 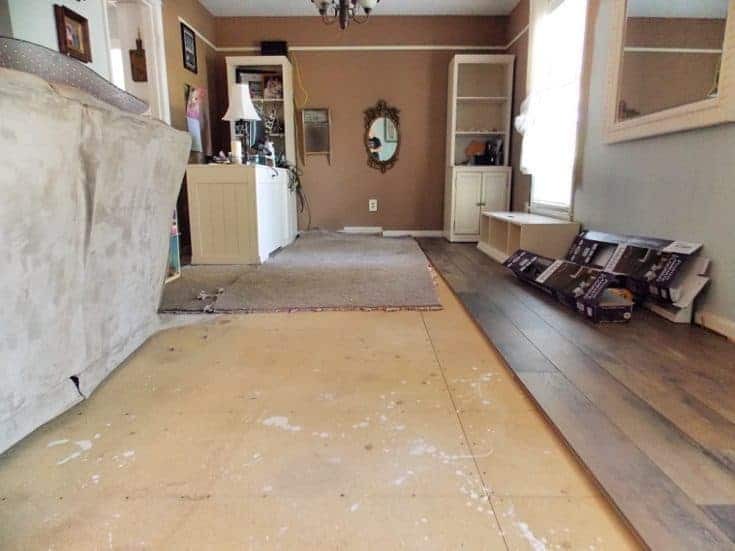 My distressed blue rug also compliments it perfectly! I had just purchased it before deciding to attempt the DIY flooring in an attempt to make my icky carpet more tolerable! I was happy to be able to still incorporate it into the design over the Select Surfaces Driftwood Flooring. As a result, I ended up redecorating the entire space AND I ended up moving my dining room table into the extra space since it was no longer carpeted! 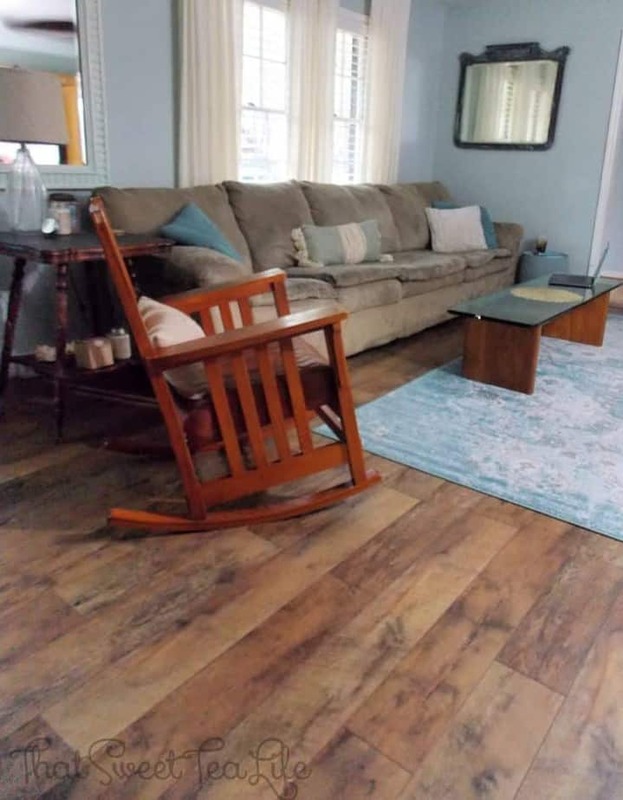 The versatility the new flooring has provided has expanded our usable living space so very much. I was able to switch the dining and office areas making the office area slightly detached from the busier living area of the house. Ill be revealing the dining area soon so you will have to stay tuned for updates. 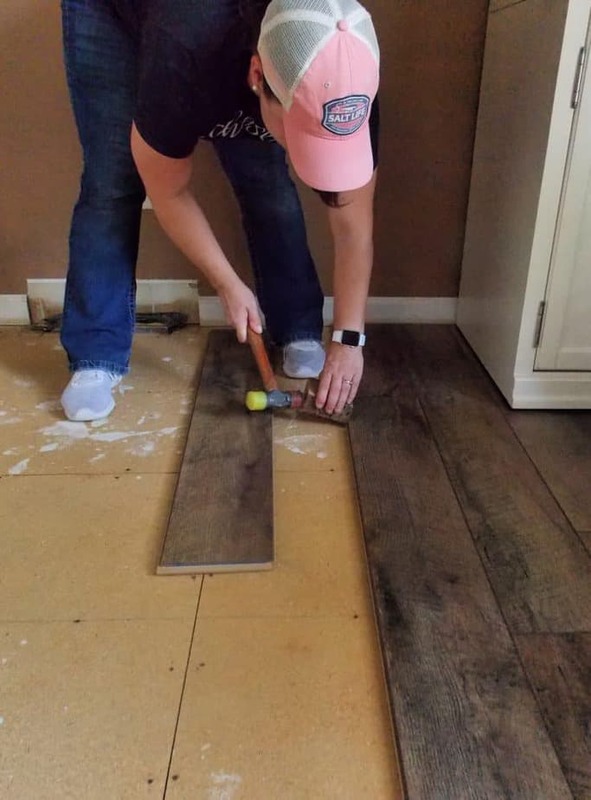 I hope you enjoyed reading about me overcoming my DIY Fears and move on to conquer your own! Till next time with Thea at That Sweet Tea Life! Beautiful! I would have expected driftwood to be grey. I love it! Can’t wait to get the rest of my icky carpet pulled up. Yeah! Should be before the end of the year!